As challenging as it can be, it’s always wise to extract as much satisfaction from the task at hand as from what the task yields. This is especially true in production woodwork, where tasks are sometimes tediously slow, repetitive and physically demanding. My approach is to have particular tools dedicated to specific processes, allowing me to build a relationship with the character of a tool and a level of expertise in knowing how best to optimize its inherent attributes. 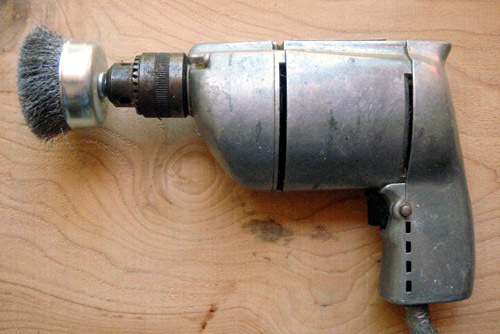 I love the vintage Craftsman “60” drill I inherited from my grandfather and have relished using it since I was a kid, but with its one speed operation and 1/4” chuck, it became somewhat obsolete with the advent of cordless drills, kind of like Mike Mulligan’s steam shovel. I could never justify using it out of sheer nostalgia, despite its no-nonsense aluminum casing and graceful mid-century styling. Gratefully, I’ve recently discovered that coupled with a wire brush, my childhood drill is the ideal tool for removing bark and stray fibers from the ‘live edge’ of my slab constructions; the speed is just right, it has just enough power but not too much, makes a pleasant sound, and warms to the touch. Plus, I feel a connection to my grandfather and recall happy times making stuff with my dad whenever I plug it in. Posted by Scott on June 16th, 2011, at 11:53 am, and filed under aesthetics, all, Best Posts, daily handwork, maintenance, studio process, visceral inquiry.